A good travel bag combo if you are traveling ike me. Lot of options to pack organisedly.. Very Good product Quality & spacious and stylish bags from Naaptol Tv. Different bags can be used for packing different itemsc. My clothes remain organised and there is no mix up. It is very easy to carry as it is lightweight. 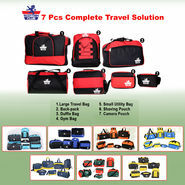 5 stars for the product and a very good combo of bags. One of the best product at this price.